New Delhi: With political activity gathering pace before the Uttar Pradesh elections, a recent increase in the price of petrol was rolled back and Bahujan Samaj Party (BSP) chief Mayawatipledged to work towards a break-up of the state if her government was re-elected. Uttar Pradesh sends the highest number of lawmakers to Parliament with 80 Lok Sabha constituencies. The state will go to the polls early next year to elect members to its 403-seat assembly. Addressing a press conference in Lucknow, Mayawati said she will introduce a resolution in the winter session of the state assembly that begins next week on carving out four new states—Purvanchal, Bundelkhand, Awadh Pradesh and Paschim Pradesh—out of Uttar Pradesh. She sought to put the ball in the Centre’s court, maintaining that as per Schedule 3 of the Constitution, the Centre has to take a decision on the renaming, reorganization or creation of new states. “The move will place Mayawati in a better position and the Congress in a dilemma," said UP-based political analyst Badri Narayan. “Congress had earlier supported the idea of division and hence cannot go back on its words. How they do it when they have contrary views on Telangana is to be seen." Andhra Pradesh, ruled by the Congress, is racked by protests calling for carving out a separate Telangana state. “The common man is not interested in the division (of Uttar Pradesh) but if she makes it a big campaign issue, she could whip up their sentiments," Narayan said. “Also, she could defend herself on the issue of governance by attributing her failure to deliver on governance to the large size of the state." On Monday, Congress general secretary and party chief Sonia Gandhi’s son Rahul Gandhi indicated he was ready to take on the battle in Uttar Pradesh and attacked Mayawati for poor governance of the state she has ruled since 2007. Mayawati has written to Prime Minister Manmohan Singh on reorganizing Uttar Pradesh, maintaining it is not in the state government’s jurisdiction to do so. “There is no popular movement for a separate state; this is a political move," said A.K. Verma, a Kanpur-based political analyst. “It also has a national impact—what position the Congress would take. 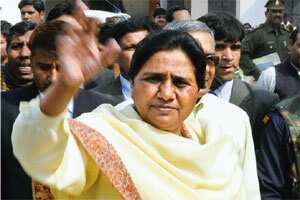 At this point of time it is not sure how much it benefits Mayawati, but, Congress will have to take a hard decision." Her rivals said the move was a political ploy. “The Congress party does not take far-sighted decisions by keeping in mind an upcoming election or immediate political gains," Congress general secretary Janardan Dwivedi said. “It is a sensitive issue. Uttar Pradesh has a different status in India, it has a different history. For a state like this, any decision like this should be taken with a lot of thinking and serious discussions." Samajwadi Party spokesman Rajendra Chaudhary said the timing of the call “at the fag end of her tenure...proves her lack of sincerity. Today’s move is nothing but a political drama."